Petros Artemis studied Law in England(barrister-at-Law) and practiced Law in Nicosia for three years. 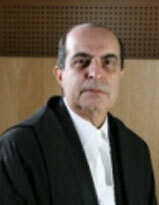 In 1972 he was appointed District Judge and after serving on the Bench for 41 years, he retired at the the age for 68 from the position of President of the Supreme Court of Cyprus. He is now President of the Scientific Council of Neapolis University and member of the special teaching staff.